Are you mad about your mother? Or does your mother drive you mad? Is your mother-daughter relationship in need of an MOT? Then enter the world of The Daughterhood and see how nine very different women navigate the most complex, frustrating and, if they’re lucky, joyous relationship of their lives. 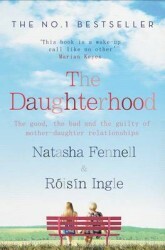 The Daughterhood is the funny, poignant and occasionally heart-breaking story that will strike a chord with daughters (and their mothers) everywhere. The Daughterhood is published by Simon and Schuster in February 2015. It's undoubtedly a brilliant concept. There are plenty of books chiding women for their failures as mothers, and promising to fix them if they follow some approved programme of self-improvement, and very few exploring what it means to be a good daughter, or why you should even try. This book is a wake-up call like no other... The Daughterhood urges us to do all we can to minimise regrets. A beautiful and fascinating read that explores the complex, joyous and sometimes frustrating world of mother-daughter relationships. The real point of this often warm, engaging and touching book is to acknowledge that your mother has a story, too. And at the end, Fennell and Ingle's mothers tell theirs. They sound like extraordinary women. They sound like extraordinary mothers. They sound, in fact, almost as extraordinary as mine.